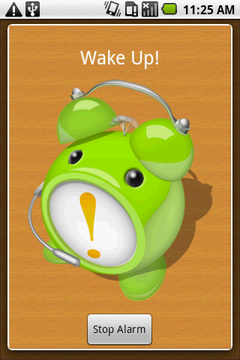 "tWakeUpCall" is a simple alarm clock application. The difference between tWakeUpCall and the other alarm clocks is that tWakeUpCall is created with "tWakeUpCallMaker" application on the Android Phone. Installed tWakeUpCall on your phone is created and presented by your friend, boy/girl friend, or child. Or you customize own favorite alarm ring. Have a nice morning by the ring of your own! An alarm rings at a scheduled time. The alarm ringtone is built into tWakeUpCall. To stop the alarm ringtone, touch the "Stop Alarm" button. 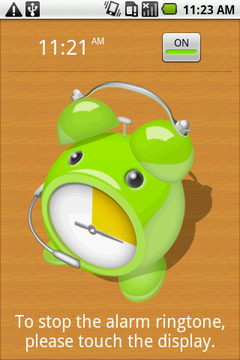 tWakeUpCall is simple alarm clock, it's easy to use. 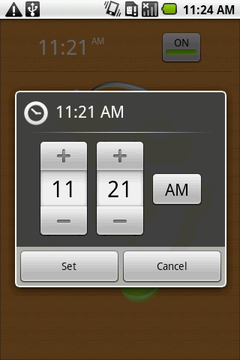 To change the alarm time, touch the time on the top of the screen. Touch ON/OFF button to turn alarm on or off. Press MENU and select "Confirm Ringtone", the current ringtone will play. To stop the alarm ringtone, touch the screen. tWakeUpCall is unpublished in the Android Market. If you use tWakeUpCall, you create with "tWakeUpCallMaker" or get from a friend. Install methods are different if tWakeUpCall is created by you or sent with Gmail from a friend. 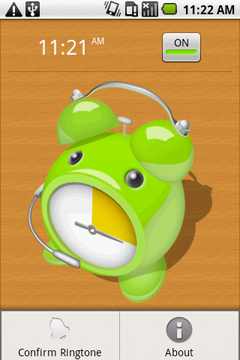 You create with tWakeUpCallMaker and install on your phone. You received as attachments with Gmail. tWakeUpCall is the copyright of a creator displayed on about dialog.